With 40 years in the skin industry, today I combine my skin health business with my health coaching business. I am an advocate of knowing what causes symptoms and finding the hidden connections to challenges. There are many faces of skin disorders when we come to realize how the gut and skin are closely connected. Our gut is where 80% of our immune system lies. If we eat poor quality foods, are addicted to alcohol and have an abundance of stress….we have reduced blood flow to the gut which leaves it compromised, unable to repair itself. Stress can be caused by toxic food choices, toxic chemicals, and toxic emotions. In order to restore color to areas of skin where melanocytes are still functional, the key is to make sure that your diet and lifestyle (including emotional stress) don’t continuously undo the re-pigmenting work that your melanocytes are constantly engaged in. Vitiligo is exacerbated by stress, so strive to keep balance. This is where a support system from a certified holistic health coach can be useful. Vitiligo can be related to thyroid imbalance and leaky gut. Intestinal permeability (a.k.a. “leaky gut”) causes both systemic and local inflammation, which in turn contributes to skin disease. Causes may include gluten, alcohol, stress, sugar, food sensitivities, and a folate deficiency. Lectins can contribute to eroding your intestinal barrier (leaky gut). Because the lectins also circulate throughout the bloodstream they can bind to any tissue in the body ­— thyroid, pancreas, collagen in joints, etc. (2) Wheat, peanuts, kidney beans, and soybeans are high in lectins. Cow’s milk, nightshade vegetables (like potatoes) can contain lectins. Lectins may be problematic because they are sticky molecules that can bind to the linings of human tissue, especially intestinal cells. With Vitiligo, most rBGH milk products including buttermilk should be avoided. Grain-fed/ GMO Beef, pork, and farmed fish are also never recommended. (3) Why? Because leaky gut not only has a direct connection with vitiligo and pesticides from GMO’s, it can also lead to brain-fog and cognitive issues. Read Labels: It is imperative to become aware and read ingredient labels in skin and sun care products. By doing this “bite-size step” we can avoid sodium lauryl sulfate, parabens and petroleum in these products. It can be toxic to keep old outdated skin care products. Now can be a good time to clean out the old and invest in organic skin care. Healthy Sleep is important for thyroid and skin health. It may prove valuable to Ditch the caffeine. Skin can become “sun sensitive”, however taking 15 minutes a day of sunshine is still better than taking synthetic Vitamin D. What is interesting is it may be a catch 22, by taking a synthetic Vitamin D because this may make skin “sun sensitive” and may add to Vitiligo (causing free radical damage). Please note: Natural sources of vitamin D are sunshine, and shiitake mushrooms. Synthetic sources are usually irradiated ergosterol (yeast) and cholecalciferol. Avoid OTC’s. Taking NSAIDs can cause sun sensitivity. These include very common over-the-counter painkillers like ibuprofen (popularly sold as Advil and Motrin), ketoprofen (Orudis), naproxen (Aleve) and celecoxib (Celebrex). Veggies. One may want to increase intake of red beets, carrots, and dark green vegetables. These pigment-rich vegetables appear to provide some level of natural protection against sun burning from the inside-out. 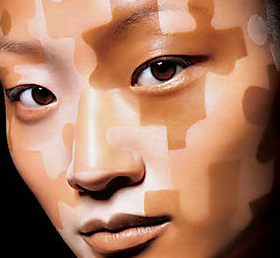 It is possible that oxidative stress is one among the main principal causes of vitiligo! (6) Free radicals from toxins are linked to oxidative stress which damages the mitochondria. Please note, oxidative stress can be caused by toxic vegetable oils that may be linked to thyroid issues. PFCs—which you’ll recognize through trade names as Teflon and Stainmaster—have been studied most for their impact on thyroid function. Look at mercury toxic exposure on the thyroid gland. At this time, you may find it important to consider taking a new approach in order to balance your hormones. Good sources of l-glutamine are raw cabbage, sauerkraut, parsley, broccoli, and spinach. In addition to this, studies have shown that those with vitiligo tend to have lower levels of glutathione, which NAC can help supplement. Good food sources of glutathione are kale, broccoli, Brussel sprouts, and asparagus. Excellent sources of folate include spinach, asparagus, turnip greens, mustard greens, parsley, collard greens, broccoli, cauliflower, beets, and lentils. Add turmeric and ginger to your meals for great digestion and to help build the immune system.